I’ve talked about this before, but I grew up in a house where a simple grilled cheese with a melted Kraft single and a little bowl of warmed up tomato soup would not only be an acceptable snack, but it could totally be lunch or dinner too. The first time I tried to serve this to my husband as a meal? It didn’t go over so well. I was totally taken aback. I mean who turns their nose up in the air at a grilled cheese & tomato soup?? The answer? Some one with a mostly Italian background, with a bit of Polish thrown in for good measure. His equivalent? Was his Mama’s homemade pierogi with his Dad’s Italian sauce for dipping. How was I going to compete?! My friends, I simply had to step my grilled cheese game up. 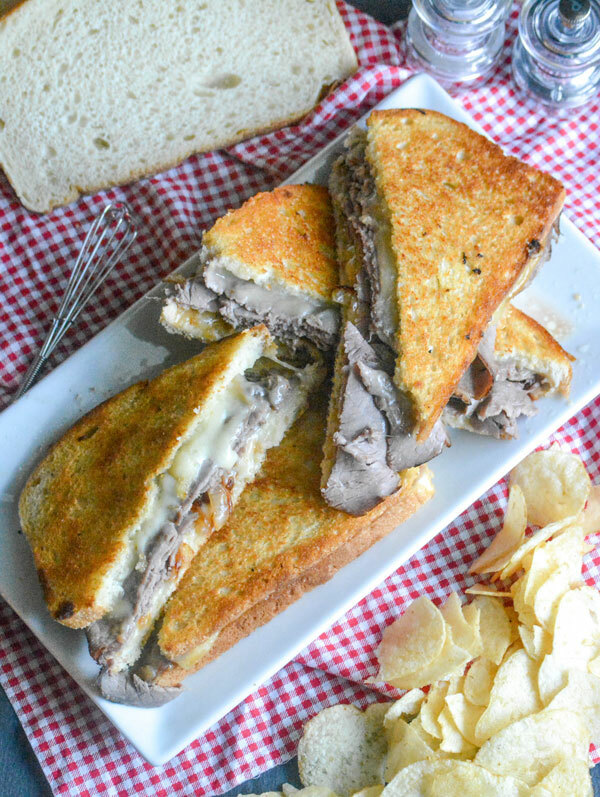 Adding in a little roast beef, swapping the simple American slices for some smoked Gouda. Did I hear caramelized onions anyone?! With a little trial & error, and one huge success- I’d solved the picky husband sandwich problem. 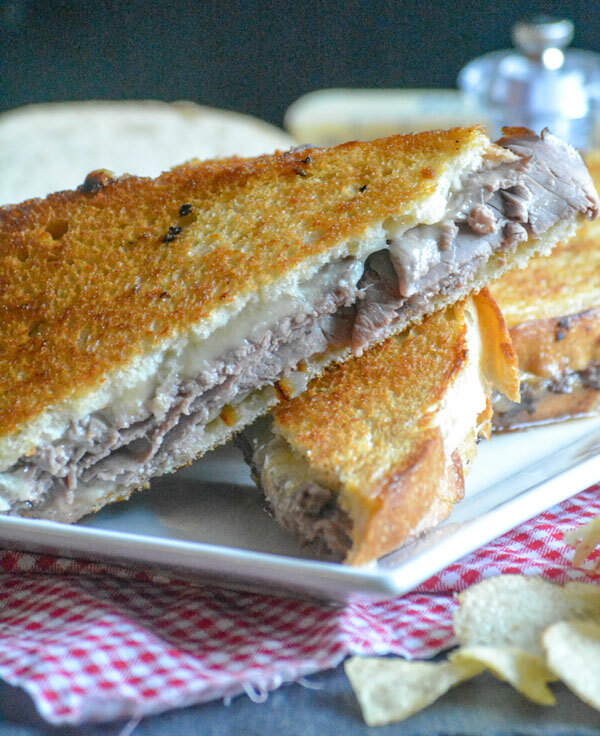 I served him a gourmet MANLY grilled cheese we both could be proud of, and couldn’t keep our hands off of in this Roast Beef & Smoked Gouda Grilled Cheese. There’s nothing simple about this crispy sandwich’s flavor profile, despite how easy it is to bring together. 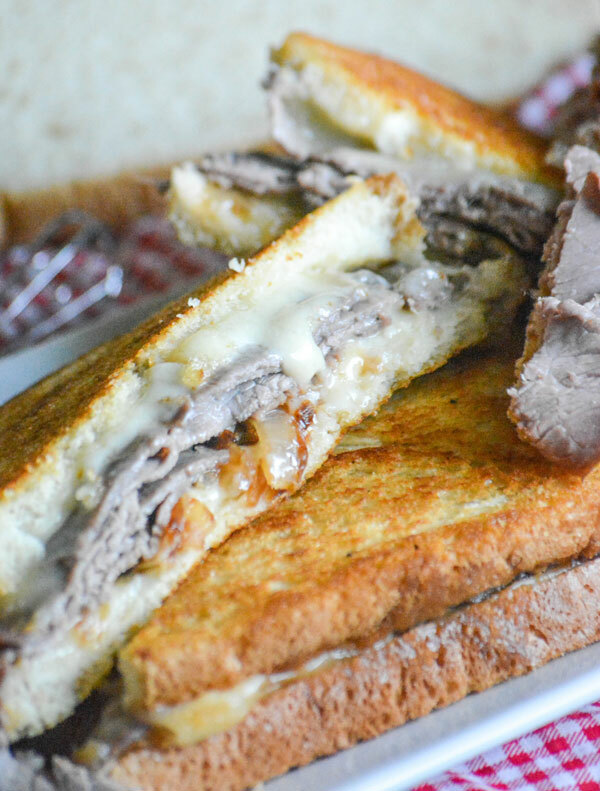 Between two crisp, buttery slices of sourdough are layers of creamy melted smoked cheese, piled high with rich roast beef, and a heaping helping of beautifully caramelize, sage flavored onions. 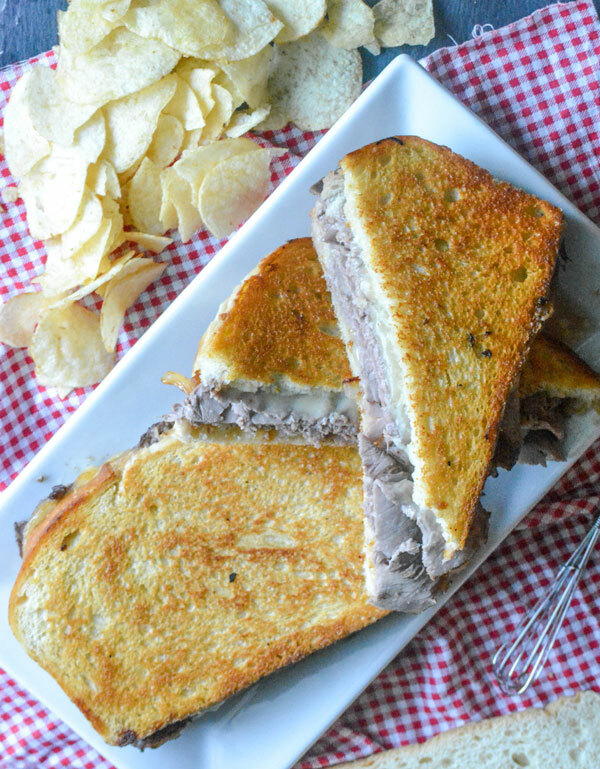 This Roast Beef & Smoked Gouda Grilled Cheese is the kinda thing you’d expect to find in a restaurant for a fancy lunch, but luckily for all of us, we’ve managed to make it easy enough for any day and in any kitchen. 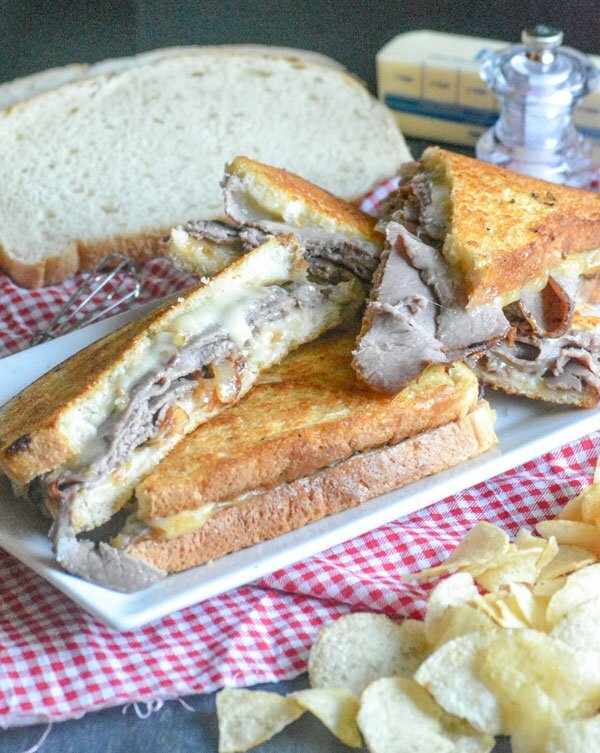 A simple grilled cheese given a gourmet upgrade with a winning combination of deli roast beef, caramelized onions, and creamy smoked gouda. Heat a griddle over medium heat. Melt a tablespoon of butter on it. Add the onions & sage, stirring to coat with the butter. Reduce the heat to medium low and let the onions saute, stirring every now and then, until they're nice and caramelized. This could take anywhere between 20-30 minutes. Butter the outsides of both pieces of bread with the remaining tablespoon of butter. Raise the heat to medium, add one slice of bread buttered side down to the center. If using, spread half the horseradish evenly out over the inside of the slice of bread. Top with 2 slices of cheese. Pile on the meat in an even layer. Top with a generous helping of the caramelized onions. Top with the rest of the cheese. Spread the inside of the remaining slice of bread with the rest of the horseradish, and place it on the sandwich, buttered side up. 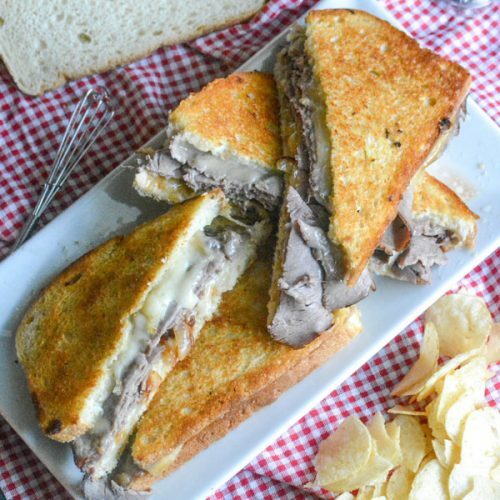 Let the sandwich sizzle, using a flat spatula to press it down once or twice to flatten some, until the bottom is golden brown and the cheese is melted, about 1-2 minutes. Carefully use the spatula to flip the sandwich and cook until the other side is also golden brown and cheese is melted, about another 1-2 minutes. Transfer the sandwich to a cutting board. Rest 30 seconds before slicing & serving. We like ours with either chips, but a warm bowl of soup would be yummy too! I am really wanting some of this! Thanks for sharing the recipe. Looks delish!